That’s not the sort of headline you’ll find in any newspaper but it is true nonetheless. The most eye popping sentiment data this week comes from AAII where only 20% of the survey respondents are bullish and 59% are bearish. The last time we had so small a group of optimists was January 1993 and May 1993. But even then, the number of undecideds was larger. Right now we have as severely a lopsided sentiment picture as ever. The “dumb money” is crowding to one side. The question is, where do you want to be? with them? or on the opposite side? I may have been a bit early when I wrote “Time to Buy” but I did add that a market rally was around the corner. I think we’re rounding that corner now. At the start of the year I got concerned that the retail option traders were too excited, buying up calls and shunning puts. We now know that the market dipped right after. Yesterday the ISEE Index pulled back to 72 - meaning only 72 calls are being bought for every 100 puts. That’s not as low as I’d like to see it but the market has turned around at these ratios before. 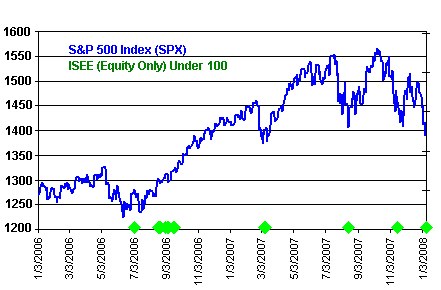 Check out my intro post on the ISEE sentiment index. Of course, it didn’t hurt that there were pervasive rumours of a surprise Fed rate cut this week. Who knows who starts these things? eh, Doug Kass? I wonder if you know? And wouldn’t you know it? In a Washington speech, Bernanke practically came out and said that rates would be cut more aggressively - “Fed speak” for half and 75 basis point cuts. Which is what I’ve been droning on about for too long. But how did it perform over the post dot com bear market? btw, that and other interesting goodies are in the “Best Of” section. The first guy has not yet signaled a bottom, the second guy has given such a signal. So, the nature of exactly what this sentiment indicator is would be helpful. I agree with the “rally around the corner” thesis, but I think the corner is a bit up the road and lacking fuel at the moment. If you look at the percentage of NYSE stocks trading above their 200-day MA, you see a very low percentage number of 27.20% (a number that’s been dropping through out most of 2007). Classically, 20% could spark a “bottom spike”, and maybe the timing is right with the Fed holding the gasoline can and a pack of Marlboro Reds. Technically, the market seems to have been eroding all year washing out weak convoluted speculation (i.e., the Financials & Housing). Maybe the wringing is just about over. Beyond technicals, what would push the market higher in 2008? I did a study of investor sentiment and subsequent one year stock returns. The result corresponds to your conclusion.